An assortment of homemade pies at the 3rd Annual Maui Pie TweetUp, which was free, open to the public, and also celebrated the 5th anniversary of Kula Fields, a local business that arranges and delivers weekly boxes of fresh Maui produce. 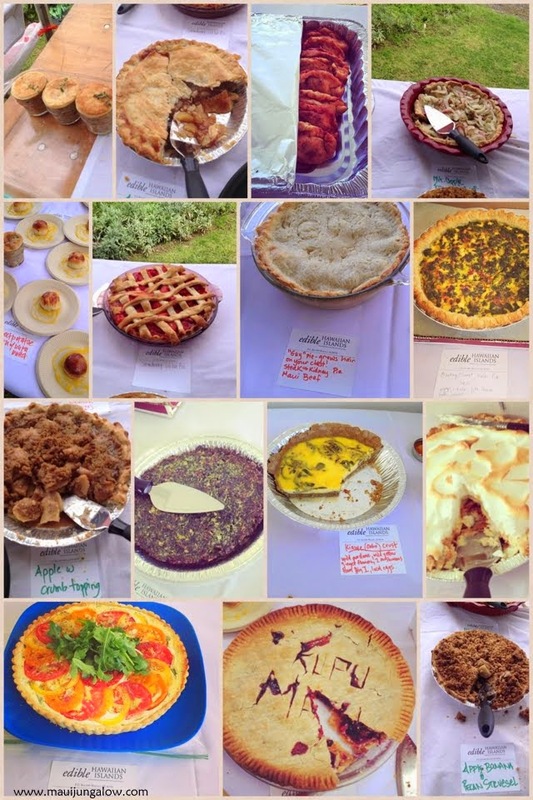 Offerings included individual chicken pot pies, strawberry and liliko'i pie, savory tomato and goat cheese pie, lemon meringue pie, quiches, cherry pie, onion pie, apple pie. Oh, and how could I forget the empanadas (small hand held crescent shaped pies)? Yum... P.S. If you made the empanadas, there are people who want to know how to contact you. Please comment below. Continue on for more pie pics! This is not an every day sight. In ten years, this is the only rainbow I've seen at this beach. Makena does get its share of rain, maybe more than other beaches in South Maui. It even rains here when other beaches a few miles up the road are sunny! It also drizzled while the sun was shining - we call this liquid sunshine. By the way, to see more rainbows, spend some time in upcountry Maui or the North Shore. Here's one of my favorite rainbow posts. This is what my back yard looks like. Up against a hill on one side, and sloping down gradually until you hit the gulch on the other side. Everything slopes, everything falls. Gravity and entropy are king and queen. We lose stuff. Everyone does. It’s part of life. Car keys, jewelry, wallet, cameras, gate remote controls, iphones, id, credit cards, even laptops. 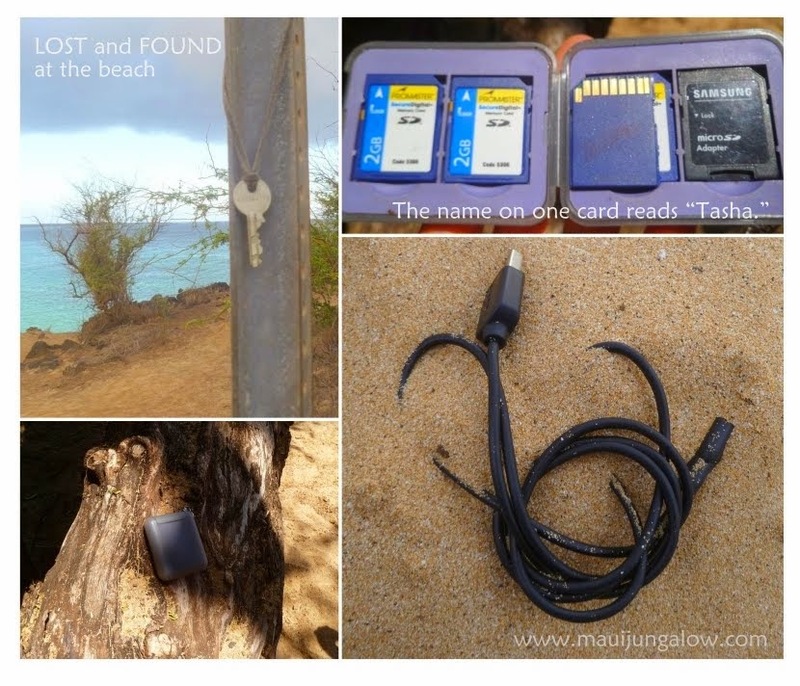 These are lost items that someone found in the last few months at Makena State Park. There are frequently lost hats, sunglasses, snorkeling gear and car keys. Sometimes items are given to the lifeguards, who then will give them to the police. Other items that are less expensive are dangled from sign posts, trees, and branches. The SD cards labeled Tasha were found on a tree stump at Big Beach. I gave them to the lifeguards. What do you do when you lose something on Maui? Can you get it back? Did someone take it? What are the chances it will show up again? Was it petty theft or were you just careless? Is it even worth filing a police report? Updated 7/11/13: Found four more pics from April! Roadside art is very real on Maui. 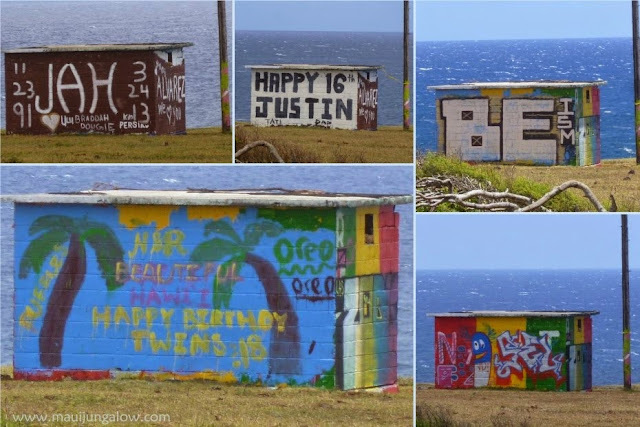 This local phenomenon, which I call the "Ho'okipa Pillbox" since it was part of an old WWII radio station, gets face lifts all the time. It's on privately owned property on the bluff of Ho'okipa, along the North Shore of Maui, but the landowner doesn't seem to mind that people sneak through the fence, go around the cow pies, and paint, often stealthily at night. The murals celebrate so many things: birthdays, memorials, comments on life, and who knows what else? 7/1/13 – Beautiful Atmospheric Effects – Astronomy lecture at the Institute for Astronomy. Ever wonder about the “green flash,” lunar haloes or why sunsets are colorful? 6:30 pm. Pukalani. Free. Glowing sunset rays at Big Beach. 7/1/13 – Food Forests and Ecovillages Working Group – Pukalani. 7pm.